The Scottish Terrier, also known as the Aberdeen Terrier, is one of give Scottish terrier breeds and was created to hunt small vermin, such as rats, mice and squirrels. It is a feisty digger and is also famous for its distinctive profile. Throughout its history, the Scottie has earned a wide range of nicknames and the fourth Earl of Dumbarton did for instance refer to this dog as “Little Diehard”. In this article you will find a lot of interesting Scottish Terrier dog information. Did you for instance know that the Scottish Terrier is believed to be the oldest of the Highland terriers? The wiry coat needs to be brushed on a regular basis, and during the shedding periods brushing will be an even more important part of Aberdeen Terrier dog care. Outside the shedding periods, the Scottish Terrier sheds little or no hair. You also need to have your Aberdeen Terrier professionally trimmed twice a year. Most keepers leave the hair on the body long, like a skirt, while having the hair on the face lightly trimmed and then brushed forward. 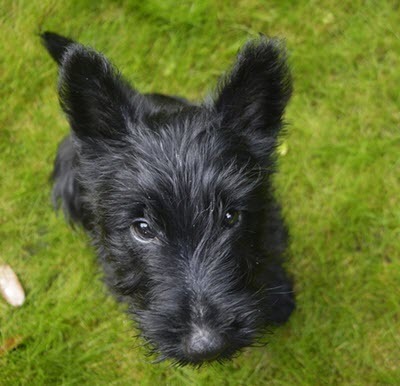 The Scottish Terrier dog puppy is a wonderful bundle of joy, but before you decide to get one you should ask yourself if you are really prepared to provide with this dog with everything it needs for the coming 12-15 years. You should also determine if the Scottish Terrier is the perfect breed for you and your life style. Getting an Aberdeen Terrier is a great idea if you want a small dog that is very robust and heavy boned; one that only needs moderate exercise and that doesn’t shed a lot. Getting an Aberdeen Terrier is however a bad choice if you do not want a coat that needs to be brushed and trimmed. You should also keep in mind that the Aberdeen terrier is one of the most independent and strong-willed of all the terriers, and it needs an owner that is even more stubborn and determined. The Scottish Terrier is also equipped with a strong hunting instinct, can be aggressive towards other animals and suspicious of strangers. The Scottish Terrier is playful and independent, and this must be taken into account during Scottish Terrier dog training. It is clever and will normally grasp new commands very quickly, but it is also quite stubborn and the key to successful Aberdeen Terrier dog training is to be even more stubborn than your dog, while simultaneously begin fairly gentle during the training sessions. Persistence, not yelling or punishments, is the best course of action. With proper training, the Scottish Terrier can become a good watchdog since it can be thought to bark only when something bad is about to happen. Early socialization is an important part of Scottish Terrier training since improperly socialized Scottish Terriers tend to be aggressive around other dogs. Even well-trained Scottish Terriers should be walked on a leash, because they have very strong hunting instinct when it comes to small animals such as rats, mice and squirrels. According to the American Kennel Club standard, the aim of Scottish Terrier dog breeding should be to develop small, compact and short-legged dogs that are sturdy built. In proportion to the size of the dog, the head should be long. Ears and tails should be erect and an Aberdeen Terrier should always be bold and confident. When it comes to the coat, the aim of Aberdeen Terrier dog breeding should be dogs equipped with hard, wiry and weather-resistant coats. The coat should be broken and consist of a hard, protective outer coat and a soft, insulating undercoat. When getting an Aberdeen Terrier, it is important to stick to responsible Aberdeen Terrier dog breeders that strive to minimize the risk of hereditary disease. The Aberdeen Terrier is prone to develop certain cancers, including bladder cancer, malignant melanoma, gastric carcinoma, and nasal carcinoma. Other examples of health problems associated with the breed are Scottie cramp, patellar luxation, von Willebrand disease, and craniomandibular osteopathy. 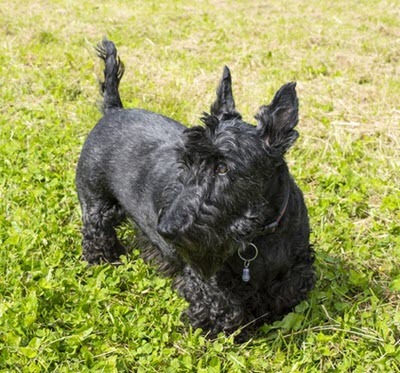 For certain types of hereditary disease, such as von Willebrand disease, it is possible to screen the dogs, and responsible Scottish Terrier dog breeders will naturally make sure that such screenings are carried out before any dog is used for breeding. The Scottish Terrier dog price varies a lot, and it is important to find out what you actually get for your money. Going for the lowest possible Scottish Terrier dog price can be an expensive decision in the long run if you fail to investigate exactly why the price is so low. Getting an unhealthy dog or a dog with behaviour problems can be very expensive in the long run, and trying to save a few bucks on the Aberdeen Terrier dog price by going to a less serious breeder is seldom worth it.